Article Courtesy of California Labor Federation. Featured Image Courtesy of SEIU. 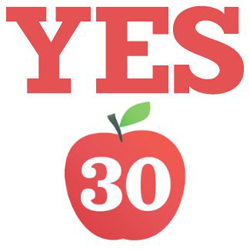 Yes on 30 Logo Courtesty of UESF. After years of cuts, California’s public schools, universities and local public safety services are at the breaking point. Once renowned for our world-class education, California now ranks 47th in per-pupil funding. Police have been taken off the streets and firehouses closed. These cuts hurt California’s middle-class, working families, children and college students the most. We cannot keep cutting schools, universities and public safety and expect our economy to grow. We need to invest in our future. Prop 30 gives Californians a real opportunity to take a stand for schools and public safety. Prop 30 is the only initiative that will protect school and safety funding, while addressing the state’s chronic budget problems. Prevents deep school cuts: Schools face an additional $6 billion in cuts if Prop 30 does not pass. Instead, Prop 30 will provide billions in new funding starting this year, which will go towards things like smaller class sizes, updated textbooks and rehiring teachers. Learn more. Puts more cops on the streets: Prop 30 will make sure public safety is required in our state’s constitution, so that funding cannot be cut without voter approval. It will put more cops on the streets and save the state billions on future prison costs. Learn more. Helps balance the budget: Prop 30 is a critical step in addressing the continual budget shortfalls that plague California. It will help pay down the state’s debt— built up by years of gimmicks and borrowing. Learn more. Working families are struggling to make ends meet while the wealthiest Californian’s enjoy record income growth. It is time that the wealthy pay their fair share. Prop 30 raises income taxes just for the wealthiest Californians. Although there is a slight sales tax adjustment in Prop 30, rates will be lower, that’s right lower, than they were a year ago. And the measure would protect taxpayer dollars by ensuring that the revenue cannot be spent on bureaucracy or administrative costs, and it will be placed in a separate fund, audited annually, that the legislature cannot touch. Governor Brown, labor unions, the League of Women Voters of California (LWVC), educators, law enforcement professionals, community groups, and healthcare advocates all support Prop 30 (see the complete list) .They recognize it as they best way to address California’s deficit while at the same time protecting our schools and putting more cops on the streets. After $20 billion in cuts to our schools over the last four years, it’s time to draw the line because we know the countries that out-educate us today will out-compete us tomorrow. Supporting the Governor’s initiative means protecting schools and local public safety so we can invest in a strong common future for California. It’s past time for everyone in California to pay their fair share of taxes to fund education and services, including the wealthy. The 1% has doubled its share of state income in the last twenty years, while paying lower tax rates. Proposition 30 will prevent even deeper harm to our students, and begin to put California on the path to restoring the programs our families need and deserve. The Schools and Local Public Safety Protection Act will keep cops on the street and get our state back on track. How does Prop 30 work? Who are the backers of Prop 30? Won’t most of the revenue get lost in the bureaucracy? How does Prop 30 prevent deep school cuts? Why is this initiative good for public safety? How does Prop 30 help balance the budget? To protect schools and local public safety, Prop 30 temporarily increases personal income taxes on the highest earners – about 1% of CA filers – and establishes the sales tax at a lower rate than it was last year. Families earning below $500,000 will pay no additional income taxes. The increase affects only the highest earners. Prop 30 asks those who earn the most to temporarily pay a little more on income exceeding $500,000 for joint filers, or $250,000 for individual filers. These taxes will be in effect for seven years. According to a recent LA Times poll, the majority of Californians favor this proposal. To protect schools and local public safety, Prop 30 also temporarily raises sales taxes one-quarter of one percent. Even with this slight increase, sales taxes will still be lower than they were last year. These taxes would expire in four years. The revenue from Prop 30 will go directly to schools and public safety services on the local level. The funds will enable our state to pay off its debts, and if economic growth is consistent with historical patterns, this growth will enable California to keep pace with its commitment to schools and public safety, even after the temporary taxes expire. Prop 30 is endorsed by Governor Jerry Brown and Speaker of the Assembly John A. Pérez, along with a broad coalition of labor, education, public safety, community, business and health care organizations. See the full list of endorsements. Won’t most of this revenue get lost in the bureaucracy? NO, Prop 30 is intentionally designed to protect taxpayers. New money raised by this initiative will be put into an independently-audited special fund that the legislature cannot touch. Prop 30 revenue also cannot be used for state bureaucracy or administrative costs, including the salaries and benefits of administrators. Schools are often the first victims to lose funding when the economy is suffering. In the last four years alone, our schools have been hit with $20 billion in cuts, more than 30,000 educators have been laid off, and our class sizes are among the largest in the country. But the story doesn’t end there. If Prop 30 does not pass, our schools and colleges face an additional $6 billion in devastating cuts this year. There will be larger class sizes, tuition hikes, more teacher lay-offs and a shorter school year, among other terrible cuts. Schools and community colleges will lose over half a billion in funding and city police departments would lose 20 million in grants (see the breakdown) . Students attending the University of California would see tuition increase by 20%. Prop 30 will provide billions in new funding for our schools starting this year. There will be smaller class sizes, updated textbooks, and more teachers around to help students. Public safety is anything needed to ensure a safe environment, from preventing crime by putting more cops on the streets, to protecting children through child welfare services. Public safety programs also include supportive services such as substance use disorder, mental health services, foster care and many more public services. Prop 30 will guarantee public safety funding through writing it into the state constitution. It will also move public safety programs closer to the people by localizing the programs so that local elected officials can decide how best to meet their community’s needs. Prop 30 will also help California save billions in future prison costs. Prop 30 kills two birds with one stone: while investing in schools and public safety through taxes, it frees up other state revenue to go towards the state budget deficit. The Governor’s initiative is the only measure on the November ballot that works within the framework of the state finance system and, therefore, will actually help eliminate the structural budget deficit. Important government services like health care depend on a balanced, adequate budget. Prop 30 is a critical step in addressing the continual budget shortfalls that plague California while also prioritizing our schools and public safety. Learn more about Prop 30. Join the fight to pass Prop 30! UT San Diego: What would happen if school year drops to 160 days?